Had lunch and a few beers with Foondoggy, gave him a quick tour of the flat beaches. Mike G and I met in Tampa at a popular bar called the Green Iguana. We hung out for awhile. He shared stories about meeting Neal & Bud while I talked about Egosurf and Surfgeo, as well as the elusive G. Duke. Some of his friends were well traveled as well, I enjoyed hearing one guy's adventures in Cairo. Had anklesnapper sessions on the Gulf and NSB with Gamivia Duke, he called them the smallest waves he's ridden in 10 years and threatened to kill me if photographic evidence surfaced. We've surfed together several times since then. Surfed with BTW and BMI, met both of them in the lineup in Cocoa Beach. Spent a week in Costa Rica with Herb Silio. Herb was the first ASer I had met in the flesh. 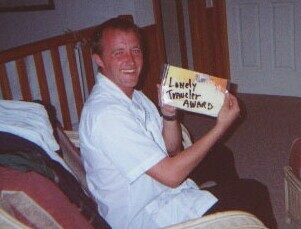 In fact, I hadn't met him until we were on the way to his family's villa in Costa Rica together. I think we may have been the first ASers to do a surf trip like that. It did seem a little crazy at the time. The funny thing was I brought an old friend along, and he was the one that seemed a little "strange." That was about 6 years ago (1997). Who ever figured we'd devise a Point Scale to keep track of A.S. encounters, and that almost everyone here has met someone else now. Travelled with Surfgeo, Egosurf, and Tim Holt to Mexico. We met and surfed with Jose Borrero in Mexico, but he was traveling seperately. In Panama (PanamaOlas) I added Doc, JB, Gioni, Eddie, and Mark. I'm not sure if others are considered ASers. I think I might be missing somebody too. 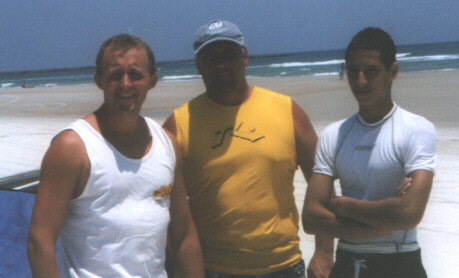 See a pic of (left to right) me, SurfGeo and his son at NSB this June of 2001.